The best early map of Yellowstone Park! Yellowstone National Park and Portion of Yellowstone Forest Reserve. Geology Sheet XVII. 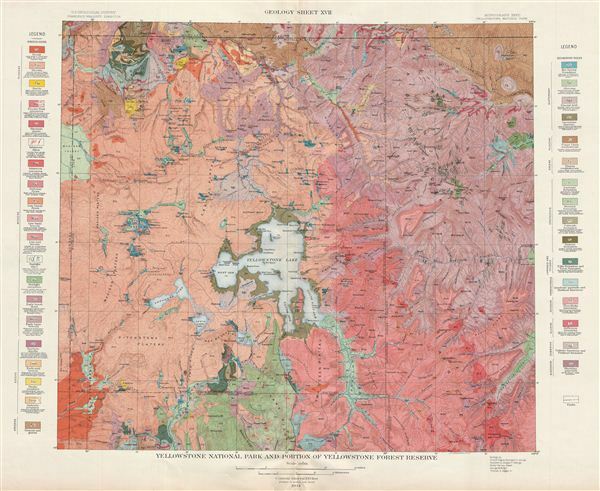 A fine example of Arnold Hague's 1904 geological survey map of the spectacular Yellowstone National Park, Wyoming. Centered on Yellowstone Lake, the map covers the entire park as well as the adjacent parts of the Yellowstone Forest Reserve. This particular map was part of Hague's study of the regions unique geology and the related geothermal activity. The map is color coded to identify different geological zones with a detailed key to either side of the map proper. Throughout countless well known Yellowstone sites are noted, including the Geyser Basin, mountains, rivers, lakes, volcanoes, plateaus, and valleys. Published by the United States Geological Survey in 1904. The Office of the Coast Survey (later the U.S. Geodetic Survey) (1807 - present), founded in 1807 by President Thomas Jefferson and Secretary of Commerce Albert Gallatin, is the oldest scientific organization in the U.S. Federal Government. Jefferson created the "Survey of the Coast," as it was then called, in response to a need for accurate navigational charts of the new nation's coasts and harbors. The first superintendent of the Coast Survey was Swiss immigrant and West Point mathematics professor Ferdinand Hassler. Under the direction of Hassler, from 1816 to 1843, the ideological and scientific foundations for the Coast Survey were established. Hassler, and the Coast Survey under him developed a reputation for uncompromising dedication to the principles of accuracy and excellence. Hassler lead the Coast Survey until his death in 1843, at which time Alexander Dallas Bache, a great-grandson of Benjamin Franklin, took the helm. Under the leadership A. D. Bache, the Coast Survey did most of its most important work. During his Superintendence, from 1843 to 1865, Bache was steadfast advocate of American science and navigation and in fact founded the American Academy of Sciences. Bache was succeeded by Benjamin Pierce who ran the Survey from 1867 to 1874. Pierce was in turn succeeded by Carlile Pollock Patterson who was Superintendent from 1874 to 1881. In 1878, under Patterson's superintendence, the U.S. Coast Survey was reorganized as the U.S. Coast and Geodetic Survey (C & GS or USGS) to accommodate topographic as well as nautical surveys. Today the Coast Survey is part of the National Oceanic and Atmospheric Administration or NOAA. Arnold Hague (December 13, 1840 - May 14, 1917) was an American geologist and surveyor active in the late 18th and early 19th century. Hague was born in Boston, Massachusetts in 1840. As the son of a clergyman he was well educated and graduated from Yale University in 1863. Afterwards he traveled for Europe where he pursued further studies in geology at Gottingen, Heidelberg, and Freiberg. Upon his return to the United State in 1867 Hague was assigned to assist Clarence King in a study of the surface geology of the Comstock Lode and the amalgamation process, known as the ‘Washoe Process' practiced there. When the U.S. Geological Survey was formed in 1879 Hague became a founding member. In 1883 he was commissioned as the official geologist of Yellowstone National Park and assigned to study the parks famous geysers. Hague's report on Yellowstone, published in 1904, is perhaps his most significant work and certainly the work for which is best known today. Hague died in Washington D.C. in 1917. He was a member of the National Academy of Sciences, vice president of the International Congress of Geologists, and president of the United States Geological Society. Julius (Julien) Bien (September 27, 1826 - December 21, 1909) was a German-Jewish lithographer and engraver based in New York City. Bien was born in Naumburg, Germany. He was educated at the Academy of Fine Arts, Cassell and at Städel's Institute, Frankfurt-am-Main. Following the suppression of the anti-autocratic German Revolutions of 1848, Bien, who participated in the pan-German movement, found himself out of favor in his home country and joined the mass German immigration to the United States. Bien can be found in New York as early as 1849. He established the New York Lithographing, Engraving & Printing Company in New York that focused on the emergent chromo-lithograph process - a method of printing color using lithographic plates. His work drew the attention of the U.S. Government Printing Office which contracted him to produce countless government maps and surveys, including the Pacific Railroad Surveys, the census, numerous coast surveys, and various maps relating to the American Civil War. Bien also issued several atlases both privately and in conjunction with a relation, Joseph Bien. At the height of his career Bien was elected president of the American Lithographers Association. After his death in 1909, Bien's firm was taken over by his son who promptly ran it to insolence. The firm was sold to Sheldon Franklin, who, as part of the deal, readied the right to printer under the Julius Bien imprint. In addition to his work as a printer, Bien was active in the New York German Jewish community. He was director of the New York Hebrew Technical Institute, the New York Hebrew Orphan Asylum, and president of the B'nai B'rith Order. Hague, A., Atlas to Accompany Monograph XXXII on the Geology of the Yellowstone National Park, (Washington, USGS) 1904. Very good. Blank on verso. Original Centerfold.